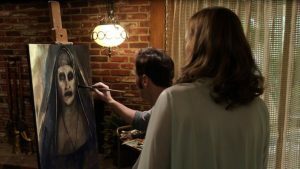 The Conjuring was a pleasant surprise when it was released, shining like a diamond amongst endless remakes and found-footage films (how long before someone remakes The Blair Witch Project? No, please don’t, that would be truly horrible in all the worse ways!). For The Conjuring was a well-written, well-directed, well-acted film, with good production values, and most important of all, scares! 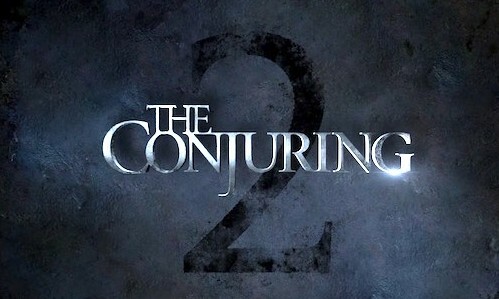 That a sequel would be produced was no surprise, and I’m happy to report it is one that definitely needs to be seen in cinema, with a crowd, so everyone can be scared together. There are many familiar faces returning, both behind and in front of the cameras. James Wan’s direction in particular is spot-on. He doesn’t show off, he tells the story, old school like John Carpenter, the way it should be. Patrick Wilson and Vera Farmiga return in their well-played roles of husband and wife paranormal sleuths Lorraine and Ed Warren. In this film the Warrens investigate a haunting in Enfield in England, based on the famous Enfield poltergeist case from 1977 to 1979, where a poltergeist was alleged to have tormented a family that lived at Green Street in Enfield. 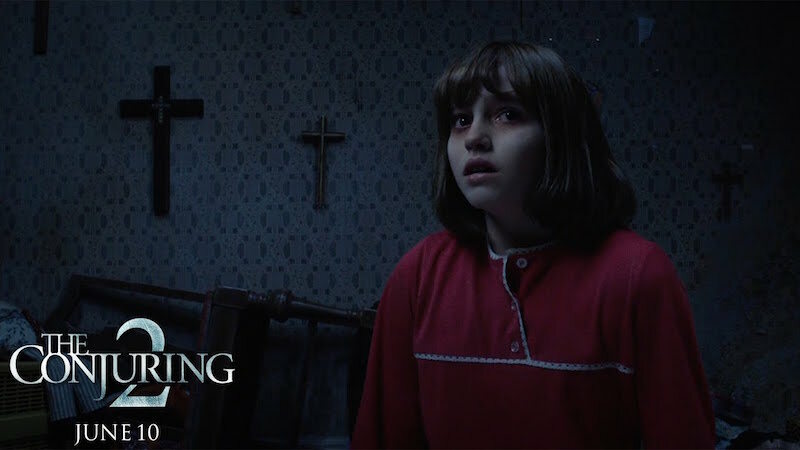 The Conjuring 2 begins with a flashback to the Warrens investigating the Amityville murders, where Lorraine discovers, in the course of a séance, that a demon possession was responsible for the murders, and she sees a vision of her husband being impaled. The following year, 1977, the Hodgson family in Enfield are tormented by a paranormal presence. One of the children, Janet, is being possessed by a certain Bill Wilkins who died in their house and seems to want to claim it back. The Church asks the Warrens to investigate. Lorraine has another vision of the Amityville demon and scrawls its name in her bible. In England, they join another team of investigators, one of whom produces video footage that makes it appear as though Janet is faking possession. The Warrens leave but discover that the spirit of Wilkins is a mere pawn for the true evil force, the demonic entity from Amityville. The Warrens return to the Hodgson house to discover Janet is once again possessed, with the rest of her family locked outside the house. A lighting strike hits the tree outside the house, leaving a jagged stump that looks like the object that impales Ed in Lorraine’s vision. Ed enters the house to find Janet at an upstairs window, ready to hurl herself onto the stump. He catches her in time but the two of them are holding onto a curtain, one rapidly tearing itself from its rings. Then Lorraine remembers the name of the demon she wrote in her bible, Valek. She knows that to know the demon’s name gives her power over it. She sends the demon back to Hell and pulls Ed and Janet to safety. 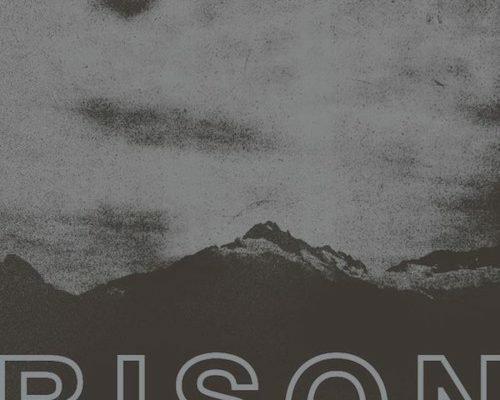 A good old-fashioned ghost story, with strong characters. You actually care what happens to them. The scares are well done, very effective; when seen in the cinema, you can really feel the tension and fear, which is as it should be. Moreover, evil is seen as an actual physical force in this film, as in the Exorcist, and so is good, a very positive thing to take from the film, and one that gives it greater depth than just entertainment.